Over the last several years, I have been studying a variety of eighteenth-century gentleman’s societies. 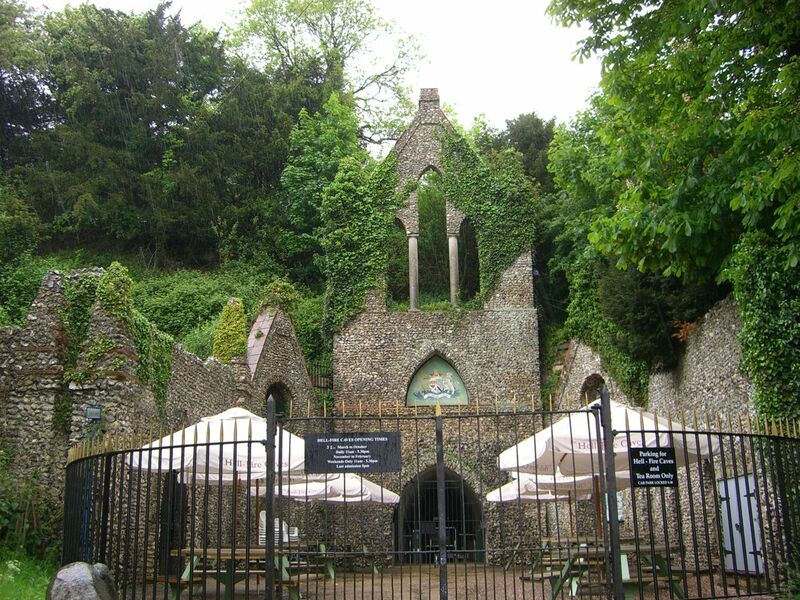 They have ranged from the ostensibly scientific and rational – such as the Royal Society and the Society of Antiquaries – to the intellectual, but hedonistic – for example the Divan Club and the Society of Dilettanti – to the secret – including The Monks of Medmenham Abbey, more popularly known as the Hellfire Club. One of the things that makes the Monks of Medmenham Abbey so interesting is the fact that they cultivated a reputation for secrecy. In other words, they were not a secret society in any simple sense. Rather, they were a private society that publicized the secrecy of their activities. In effect, it gave them an aura of mystery. It contributed to their reputations as a select and elite group who had no need to follow the strictures of popular mores in their private lives. In publicizing their group as a secret society, they were very successful. The mark that they have left on the popular imagination has been more complete than perhaps any other eighteenth-century British association, with the exception of the Freemasons. Perhaps this is because groups such as the Society of Antiquaries, with members such as Sir Hans Sloane and Richard Mead, don’t quite evoke the same response in people as a group of hard-drinking men, dressed up as monks, worshipping Satan in a cave filled with prostitutes. In this post, I survey several theoretical approaches that scholars have taken to secrets and secrecy and how it relates to the cultivation of reputation in eighteenth-century Britain. I will use these in forthcoming posts to analyze the practice of cultivating a reputation for secrets by the Monks of Medmenham Abbey. Secrecy . . . is one of the greatest accomplishments of humanity . . . . Secrecy secures, so to speak, the possibility of a second world alongside of the obvious world, and the latter is most strenuously affected by the former. Every relationship between two individuals or two groups will be characterized by the ratio of secrecy that is involved in it. Even when one of the parties does not notice the secret factor, yet the attitude of the concealer, and consequently the whole relationship, will be modified by it. In order to serve a social function, however, a secret must be performed. In other words, it is not enough to have a secret, but one must use that secret – either through its silent elision in social commerce or through the conscious manipulation of one’s own or others’ secrets. This “use” of secrets is what Hugh Urban – emphasizing Michel de Certeau’s concepts of tactics and strategies – has said is the key element to the study of esoteric religious traditions. However, most studies of esoteric groups remain internalist accounts. The secret simply serves to separate the initiated from the uninitiated, and, in this narrative, secrets serve simple, functionalist purposes of group identity formation. I know another’s secret but do not reveal it and he knows that I know, but does not acknowledge it: the intensity between us is simply this secret about the secret. The complicity has nothing to do with some hidden piece of information . . . . Everything that can be revealed lies outside the secret. For the latter is not a hidden signified, nor the key to something, but circulates through and traverses everything that can be said, just as seduction flows beneath the obscenity of speech . . . . The secret maintains its power only at the price of remaining unspoken, just as seduction operates only because never spoken nor intended. “The secret is not a hidden signified” – an important observation and one that most scholars have tended to ignore. It is, instead, the “secret of the secret” that gives a secret its sociological role – especially when the uninitiated search for the hidden signified. In the context of secret societies, the illusion of secret knowledge, practices, or rituals is important, regardless of whether or not they actually exist. The search for the hidden signified is the seduction of the secret, perhaps best summarized by the anthropologist Paul Christopher Johnson: “Secrets are to religion what lingerie is to the body; they enhance what is imagined to be present.” In the case of Medmenham Abbey, the seduction of secrecy takes on an added meaning, for the seduction was (and is) not only psychological, but it is also religious and sexual. Citation: Jason M. Kelly, “Secretism and the Cultivation of Reputation in the Eighteenth Century,” Secrets of the Hellfire Club Blog (14 February 2012), https://hellfiresecrets.wordpress.com/2012/02/14/secretism-and-the-cultivation-of-reputation-in-the-eighteenth-century/. George Simmel, “The Sociology of Secrecy and of Secret Societies,” The American Journal of Sociology 11, no. 4 (1906): 441–498, 462. Michel de Certeau, The Practice of Everyday Life , trans. Steven Rendall (Berkeley: University of California Press, 1984); Hugh B. Urban, “Elitism and Esotericism: Strategies of Secrecy and Power in South Indian Tantra and French Freemasonry,” Numen 44 (1997): 1-38, 3-4 and “Sacred Capital: Pierre Bourdieu and the Study of Religion,” Method & Theory in the Study of Religion 15 (2003): 354-89. Paul Christopher Johnson, Secrets, Gossip, and Gods: The Transformation of Brazilian Candomblé (Oxford: Oxford University Press, 2002), p. 3. Secretism was prefigured by Georg Simmel in his concept of Geheimnistnerei, or the “pretense of secrecy.” See Georg Simmel, “The Sociology of Secrecy and of Secret Societies,” The American Journal of Sociology 11:4 (1906): 441-98, 486. Jean Baudrillard, Seduction, trans. Brian Singer (New York: St. Martin’s Press, 1990), originally published as De la séduction (Paris: Editions Galilée, 1979). Bourdieu, Pierre, Distinction: a Social Critique of the Judgement of Taste, trans. Richard Nice (Boston: Harvard University Press, 1984); Urban, “Sacred Capital,” 360-1. Jason M. Kelly, “Riots, Revelries, and Rumor: Libertinism and Masculine Association in Enlightenment London,” Journal of British Studies 45:4 (2006): 759-95. This entry was posted on Tuesday, February 14th, 2012 at 12:23	and tagged with anthropology, baudrillard, de certeau, secretism, simmel and posted in Theory. You can follow any responses to this entry through the RSS 2.0 feed.